TORONTO, July 31, 2015 /CNW/ - Mohawk Medical Properties REIT, a private real estate investment trust, announced today it has acquired two, market dominant, medical office buildings in the provincial capital city of Edmonton, Alberta. 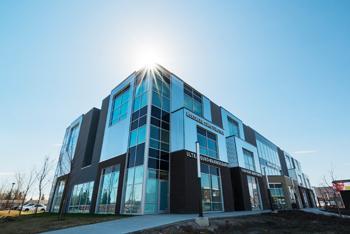 These newly constructed buildings, collectively called the ‘Glenwood Health Centre’, are strategically located with over 500 feet of exposure on the major western arterial known as Stony Plain Road. The buildings are 100% medically tenanted with over 28 physicians, a 15,000 sf family medical clinic, pharmacy, X-ray, cardiology & internal medicine clinic, lung clinic, pain & rehabilitation clinic and other medical services. Mohawk Medical Management Corp. will bring its expertise in medical office building management to provide specialized professional management services to tenants and patients at the Glenwood Health Centre. The REIT has three medical properties under contract with plans to close in Q4. Mohawk is a Toronto based private REIT specializing in healthcare real estate and committed to exceptional returns through reasonable risks. Sean Nakamoto and Andrew Shapack, whose combined track record includes 69 medical office building acquisitions, formed Mohawk in September 2012. The firm engages in acquisition, property management and asset management of Canadian medical office buildings financed through syndication to LP investors.